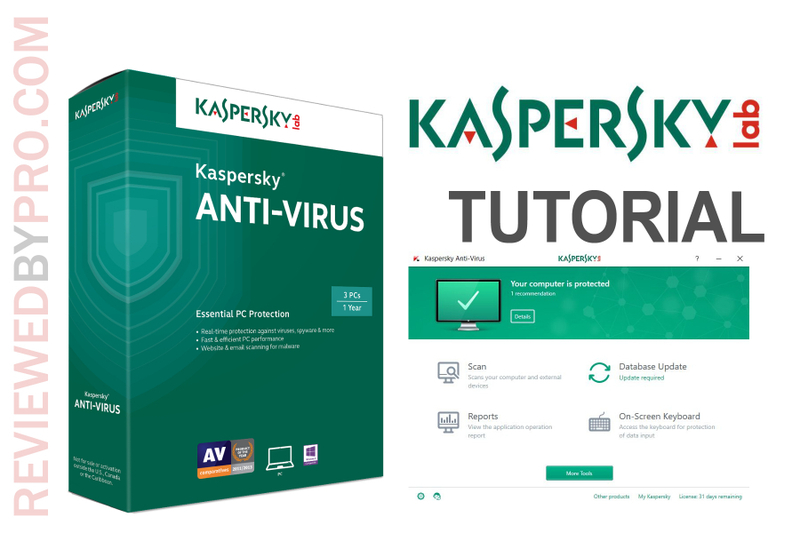 This is a short manual for the Kaspersky Anti-Virus program. To use this highly-rated antivirus software, firstly you should download it from this page. 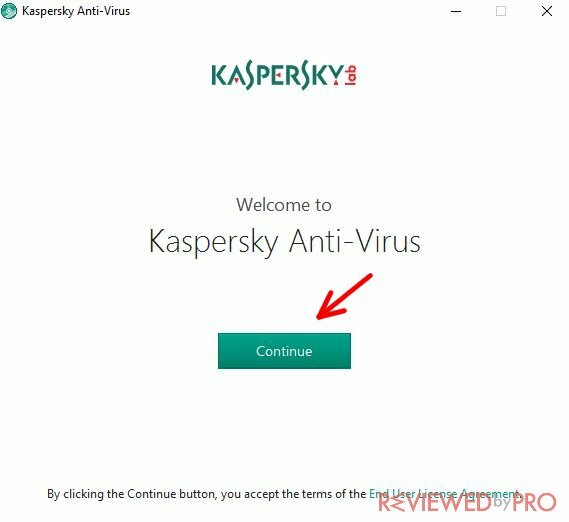 In this manual guide, we will show you how to install the newest version of Kaspersky Anti-Virus. After you download the anti-malware application from this page, you will have an installation file, which is very lightweight, as it takes up only 2.5 megabytes. Once you press on the downloaded file, you will be asked to confirm that you want to open it. 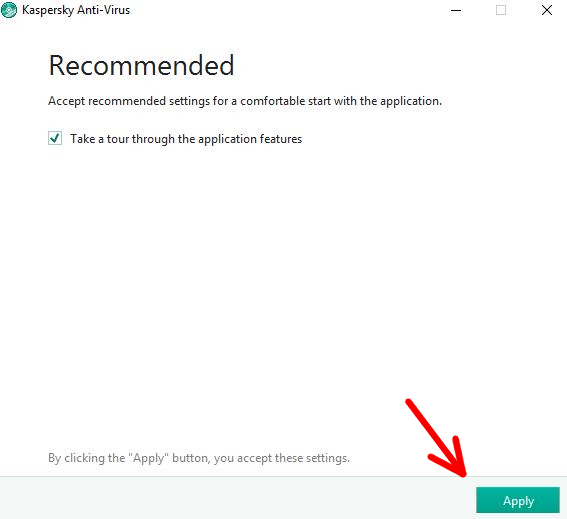 When you press ‘yes’, you will get a welcome message that says ‘Welcome to Kaspersky Antivirus’. 1. When you see the Welcome screen, simply press ‘next’ and you will see another dialogue window that says ‘Everything is ready for installation’. 2. 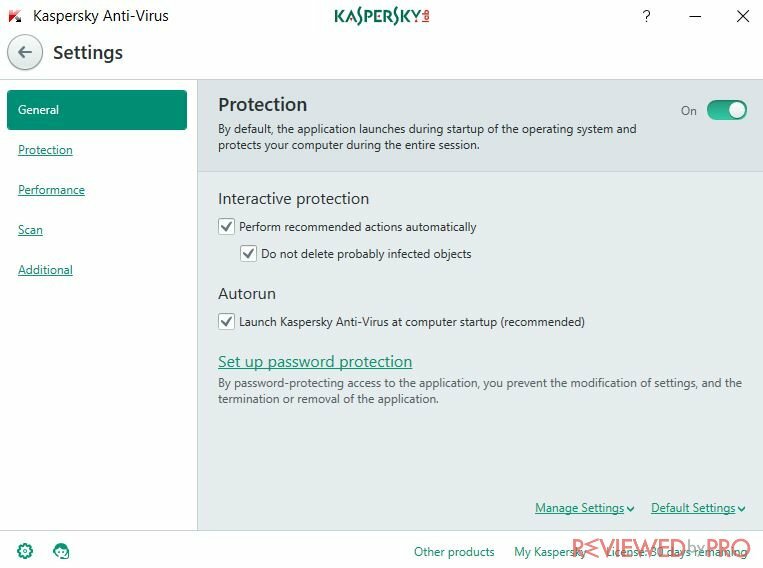 Before proceeding, you will also have an option to choose whether you want to participate in the Kaspersky Security Network (KSN) to provide optimal protection for your device. 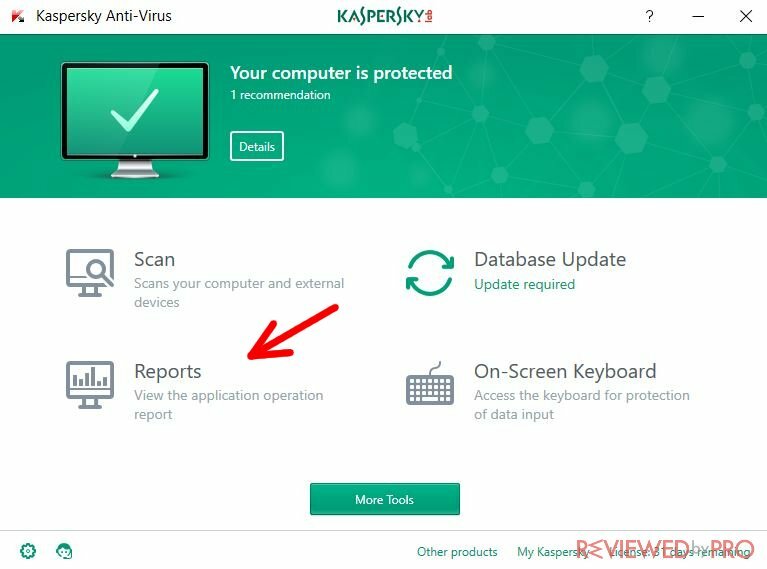 This means that your newly installed software will send anonymous signals to the Kaspersky Security Network to improve your experience and find any bugs that you will endure while using the software. We recommend leaving the tick on and proceeding to the installation by clicking 'Install'. 3. The installation process might take up a few minutes, but usually it is really fast because the software is lightweight. You will see another window with a green bar that’s going to fill the line to the endpoint, which means the software has been installed. 4. Here you can choose whether you want a quick tour on how to use the newly-installed application. You can leave the checkbox marked if you want that. 5. 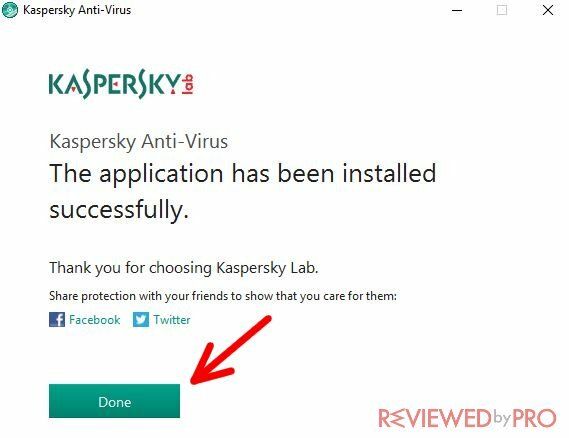 Once the app is installed, you will get a message ‘Kaspersky Antivirus has been installed successfully’. 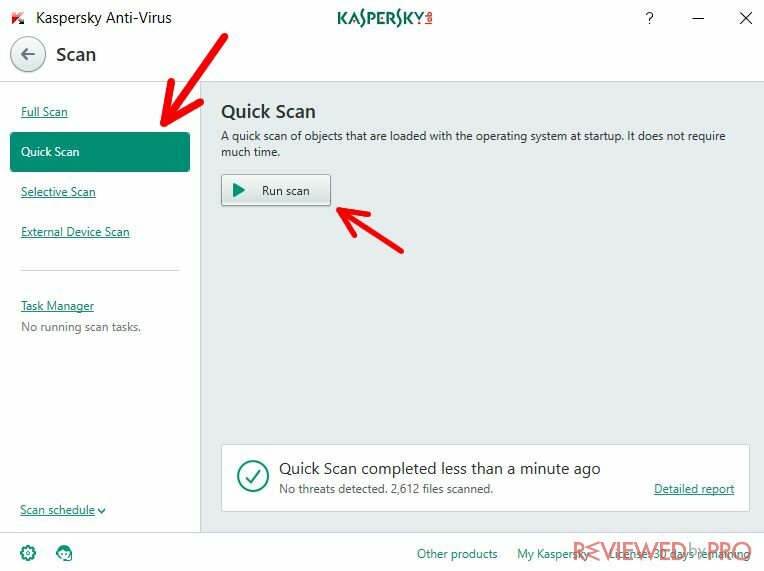 Just press ‘Done’ and you will be able to use your new Kaspersky Anti-Virus software instantly. 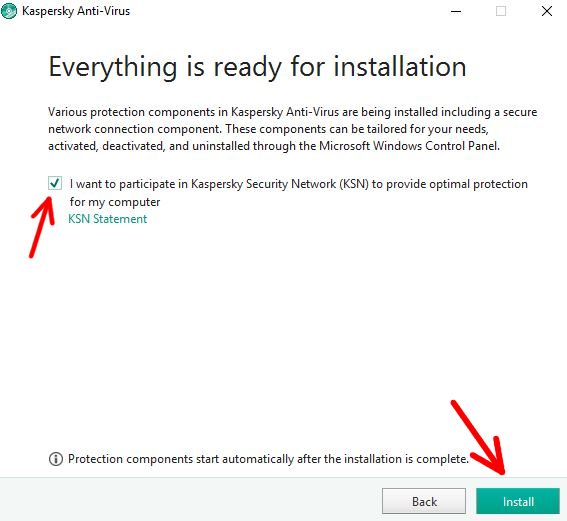 To start using the program, find the Kaspersky Antivirus icon on your desktop or press Windows Start logo and you should see a highlighted section of it that shows the newly installed program and its additional files. Press on the icon and start the program. It takes about ten seconds to load the software for the first time – the first thing you might need to do is to download the updates for an up-to-date virus detection service. It takes another few minutes to download the updated information, but that also mostly depends on your Internet speed. 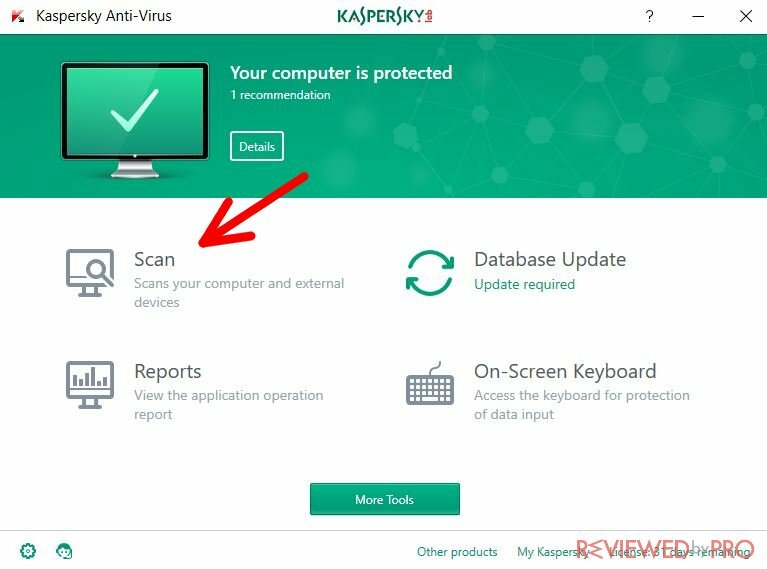 Scan – here you will be able to scan your computer and remove the active viruses. You can choose from a full scan, quick scan, selective scan or external devices scan. The full scan scans your whole system and takes up the most time. However, this is the most efficient way to check your computer for viruses. The quick scan only scans the newest files and the most vulnerable places of your operating system. The selective scan only performs scanning in the locations that you choose manually. The external devices scan only scans the USB drives, CDs and other attached devices, such as an external hard drive. Database Update – you should update the software for the newest virus databases each time before scanning. 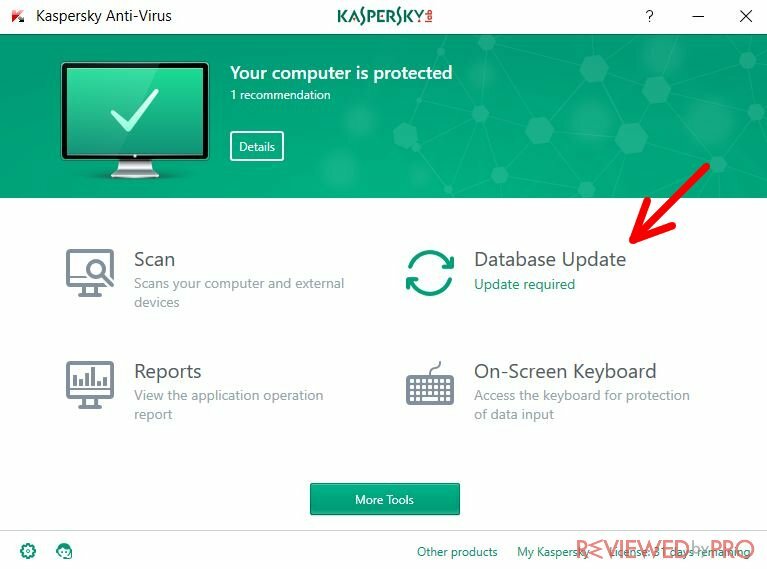 After the update is done, you can freely use your new Kaspersky Antivirus program. You can see a white and green user interface which is really easy to use – just choose a feature from the dashboard and left-click it with your mouse – the feature will pop up in a second. To return to the home screen and choose another feature, you will have to press the ‘return’ button. Reports – here you can find the information on the scans, objects deleted, and security updates. As you can see, the reports are really detailed, featuring useful information. Support – do you have any questions? 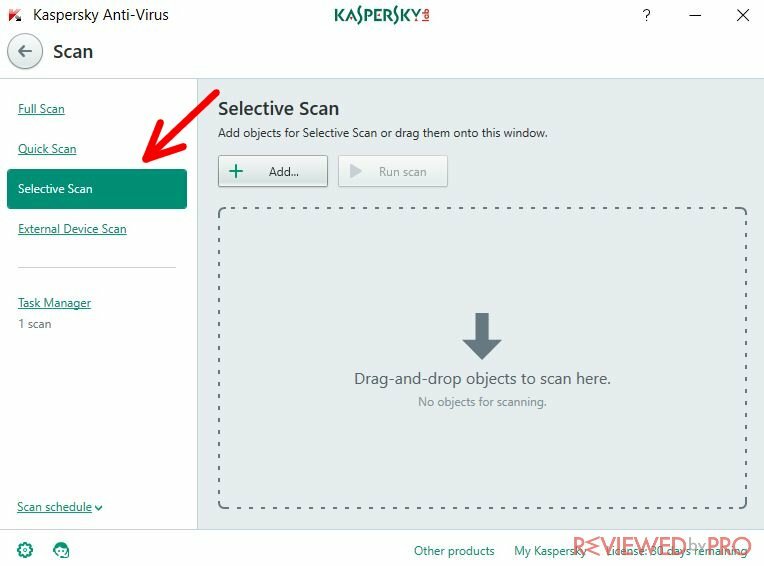 Kaspersky Antivirus malware detection tool is quite easy to use because of the simple fact that there’s a lot of self-help documentation inside of it. 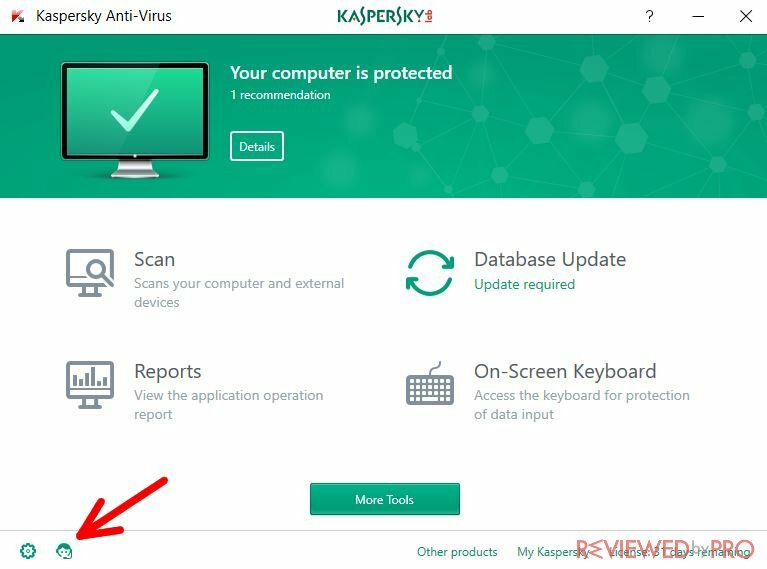 You can press the ‘help’ button and the Kaspersky Antivirus website will pop up. You will be able to search through the frequently asked questions and find a solution to your problem. 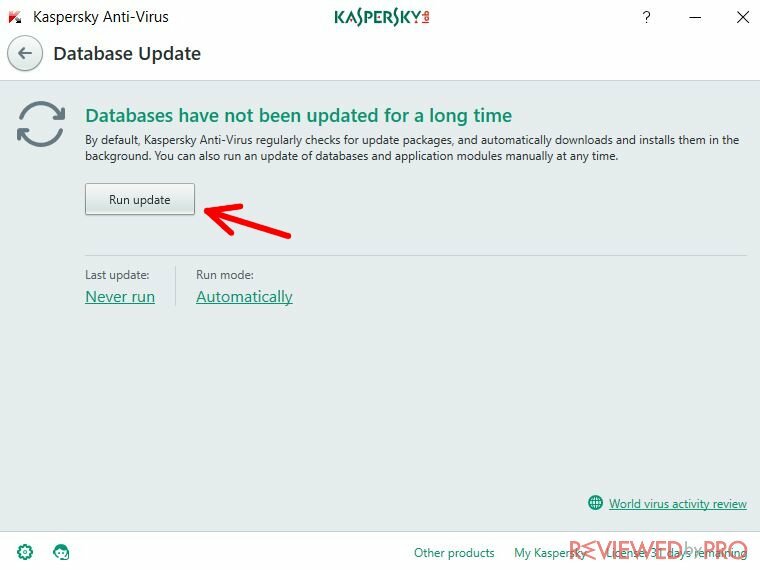 If that doesn’t help, the Kaspersky Labs also offer you live support – you can reach them by email, telephone or live chat. The company’s customer service is based in the Philippines so you will have to check out the working hours, which might differ than the office hours in your country. Settings – here you can see settings of the software, including protection, performance, and scans. However, we advise you to change settings only if you're familiar with computers and know what you're doing. 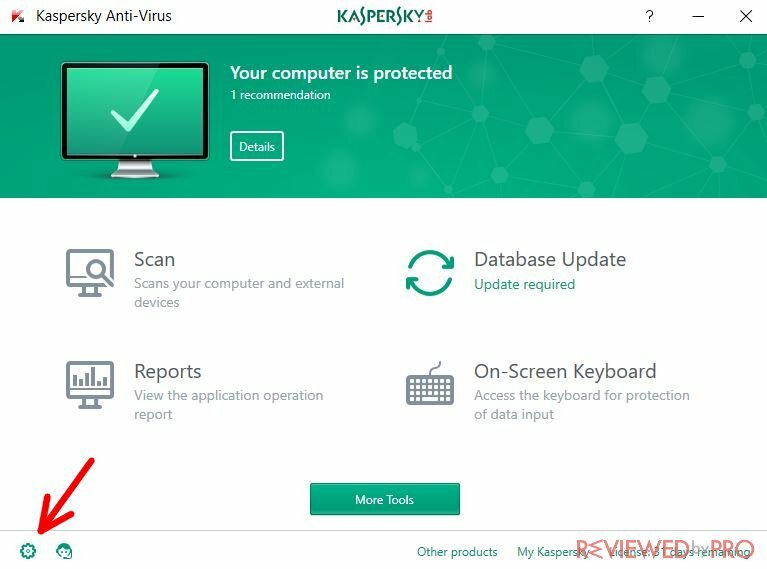 Kaspersky Antivirus 2017 is not the only product that can be purchased and installed. 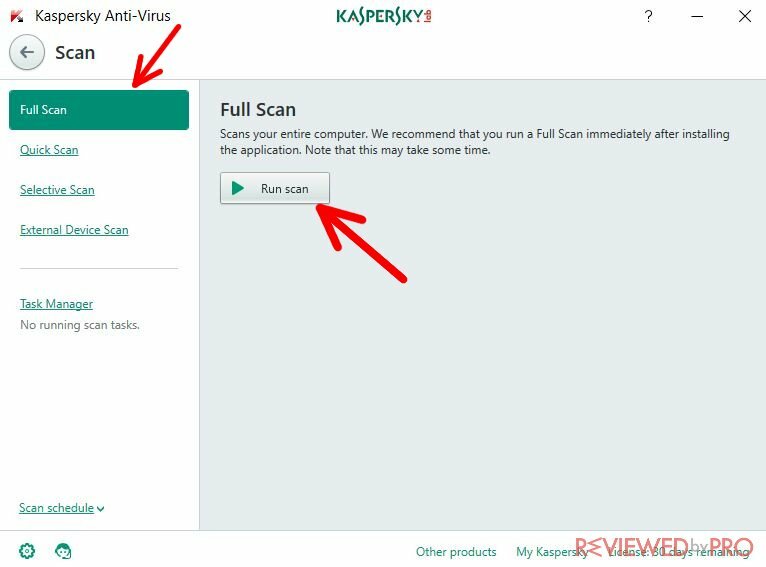 You can also choose from various other products by the Kaspersky Lab – like Kaspersky Internet Security 2017 or Kaspersky Total Security 2017. 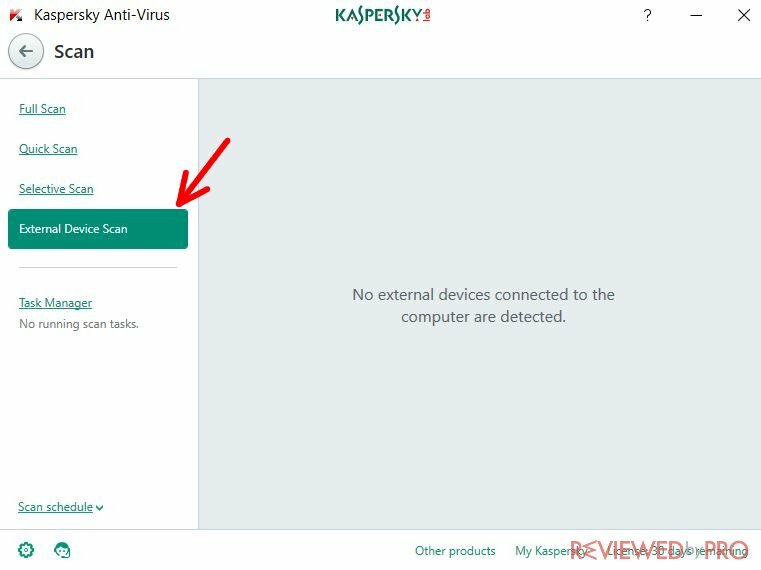 While Kaspersky Antivirus 2017 is a classic antivirus software, the Internet Security version is mostly focused on your browsing experience. It helps you stay safe while you surf the web and communicate with other people online. 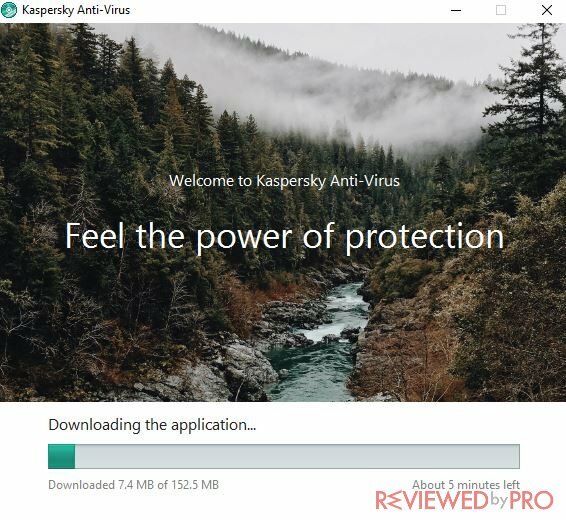 Additionally, Kaspersky Total Security 2017 is something you can use at home; if you want to protect your family, you can install Total Security 2017 on several different PCs so that all your family members would be safe. It also has a lot of family-friendly features which can help blocking 18+ websites online and make your home internet connection children-friendly. So, you can choose whichever product you want according to your needs. Basically, it is the same software with the same engine but different additional features.